Hawai’i Police Department officers, family, and friends participated in the 2009 Troy Barboza Torch Run benefiting Hawai’i Special Olympics. On Saturday, April 18, the “Guardians of the Flame” carried the “Flame of Hope” from the Kea’au Police Station to the Kea’au High School sports complex, where they were greeted by athletes representing various Big Island schools as part of the opening ceremonies for the annual games sponsored by the East and West Hawai’i Special Olympics. A similar event was held in West Hawai’i on Saturday, April 11. There, participants carried the flame from the Old Kona Airport rear softball field to Hale Halawai and back. 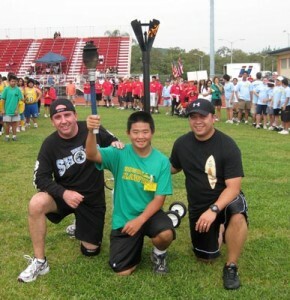 Officer Jason Grouns, Special Olympics Athlete Shawn Ono, and Officer Joseph Rocha. 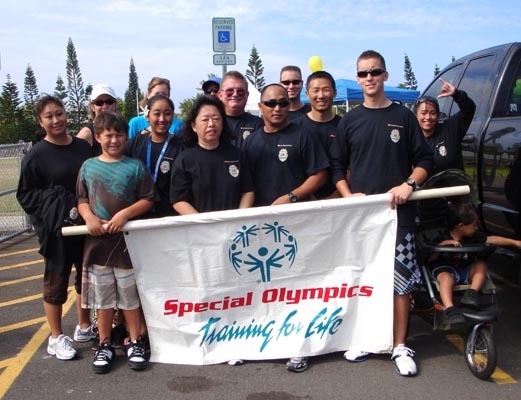 The Troy Barboza Law Enforcement Torch Run is a coordinated project of the Hawai’i Police Department and Special Olympics Hawai’i. The Torch Run was created in 1981 by Chief Richard Lamunyon of Wichita, Kansas, who, along with a couple of deputies, ran the first torch run for Special Olympics. The torch is now carried by law enforcement officers — referred to as “Guardians of the Flame” — in every state and in more than 40 other countries. This International Torch Run, which lost money in 1981, raised more than $32 million world wide in 2008. In Hawai’i, the torch run is named after fallen Honolulu Police Officer Troy Barboza, who volunteered as a Special Olympics coach and participated in the first Torch Run in Hawai’i.